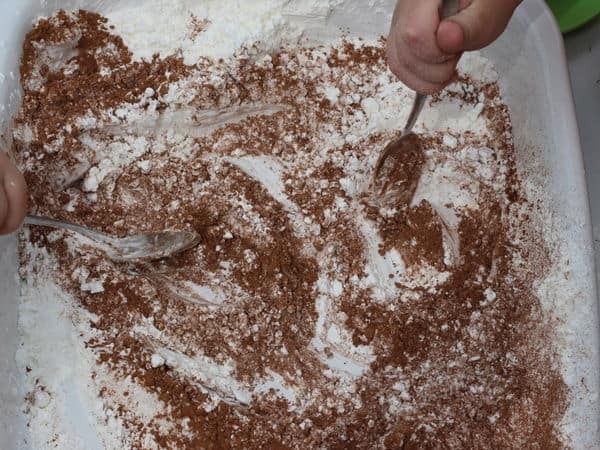 Learning about different types of fossils and how fossils are made is a fun geology activity for kids. It fits well with our rock activities for Earth Science. 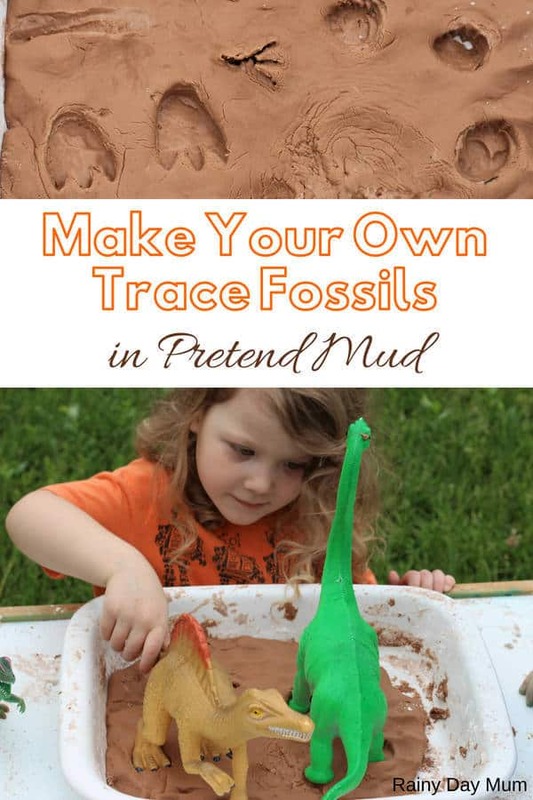 Kids will love exploring trace fossils by making dinosaur footprints in pretend mud. Fossils can be divided into two types: body fossils and trace fossils. Body fossils are made from the remains of an organism – things like bones, teeth, shells, and plant parts. They tell us what the organism actually looked like. 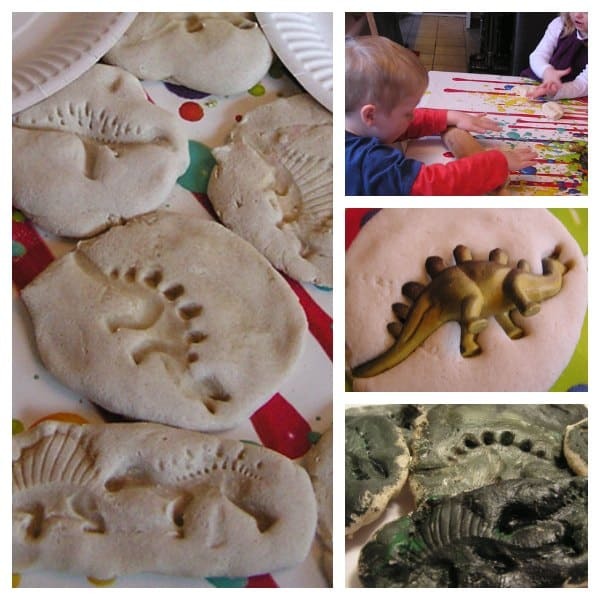 Learn about body fossils by making your own salt dough dinosaur fossils. Trace fossils show us how an organism lived. 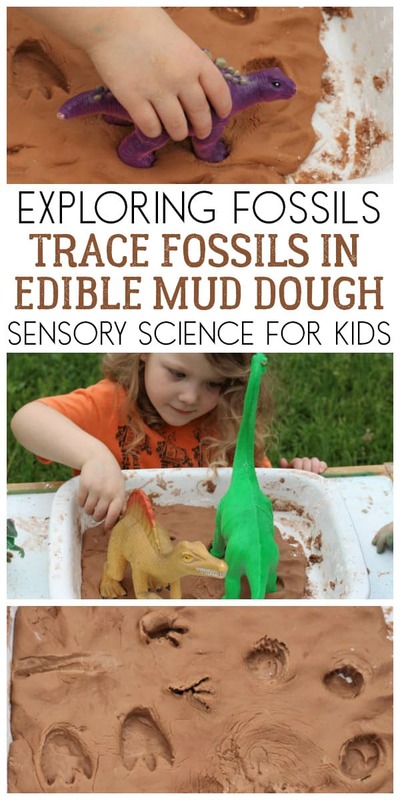 Things like footprints, burrows, tracks, and coprolite (poop) are trace fossils. 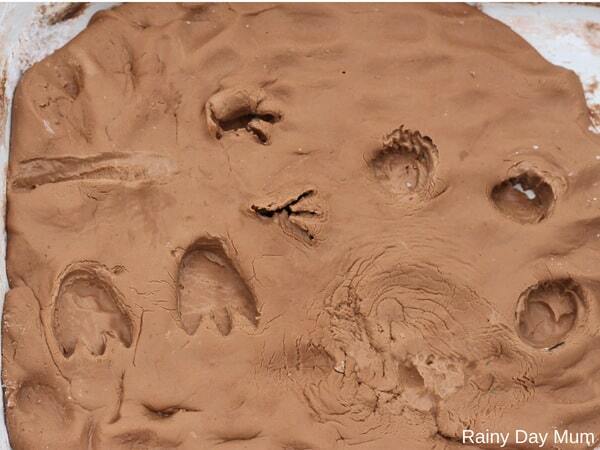 Have you ever seen footprints or animal tracks in the mud? If the conditions are right, those footprints can turn into fossils. Sediment fills the tracks and eventually turns into rock. Erosion or weathering can uncover the now fossilized animal tracks. We have included affiliate links to the products we used in this activity for kids. If you purchase via these links we may earn a small commission. When we think of fossils, we usually think of dinosaurs, so let’s look at how dinosaur footprints could turn into fossils. First, you’ll need some mud. 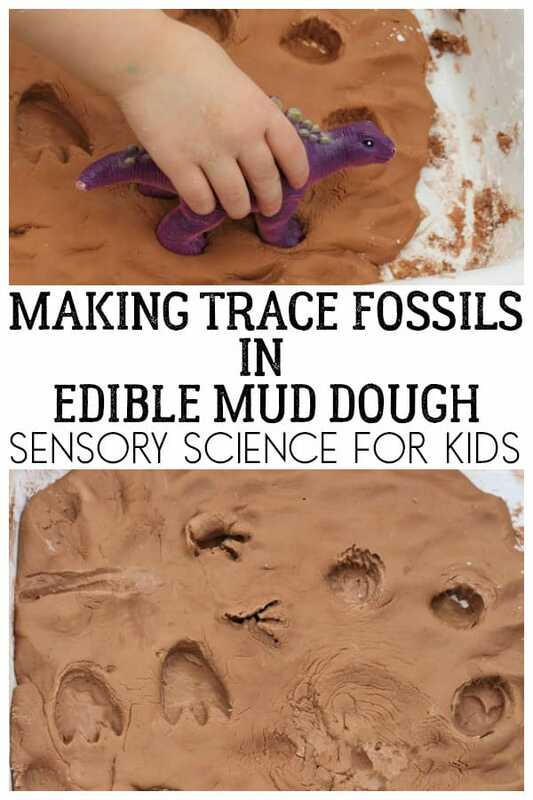 You could use real mud, but since my toddler was helping with this activity, I wanted to use a taste safe pretend mud. I made some chocolate oobleck mud dough. The chocolate gives the mud the brown color we’re looking for. Oobleck is cornstarch and water. It is a non-Newtonian fluid just like mud. To get the consistency of a dough, I added in some instant pudding mix. The gelatin in the instant pudding mix helps hold the dough together. It’s thicker than just regular oobleck. 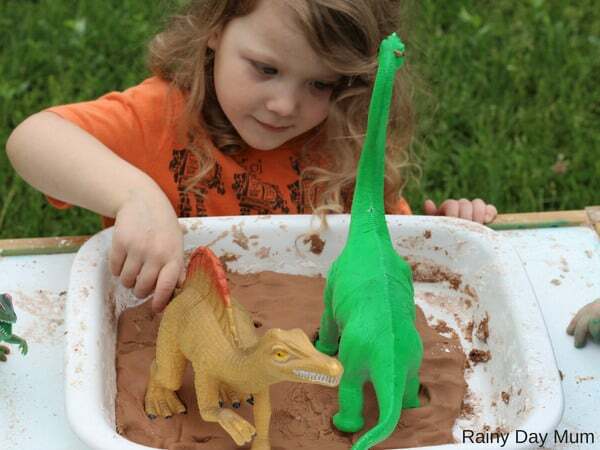 After you make the mud, it’s time to introduce the dinosaurs. When selecting dinosaurs, you’ll want to look at their feet. We found that some of the foot shapes made better prints than others. The larger feet also made better tracks. I like the Spinosaurus from this set of Jumbo Dinosaurs. We also used this set of Jumbo Dinosaurs: Mommas and Babies. 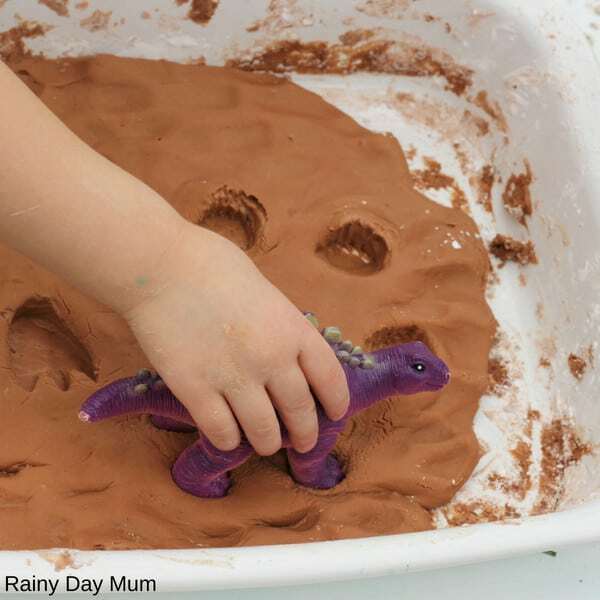 Walk the dinosaurs across the mud. 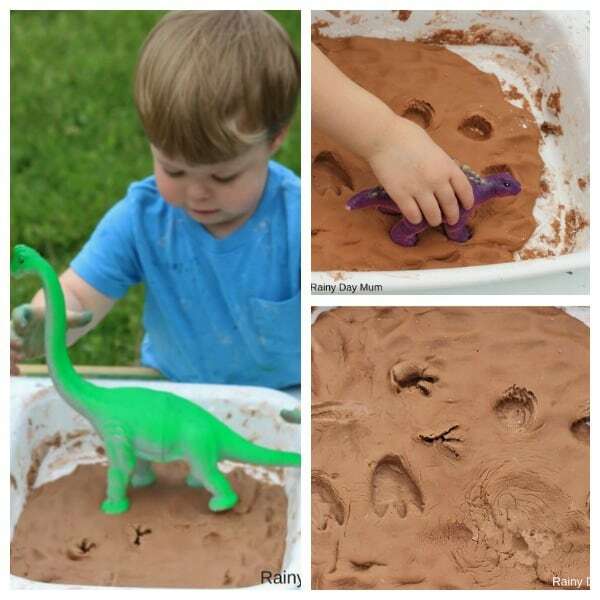 Can you vary the depth of the tracks by pushing the dinosaurs down? Would a running dinosaur make a different track than a walking dinosaur? Squish the dough and make new tracks as often as you like. When you’re finished exploring, let the tracks dry. 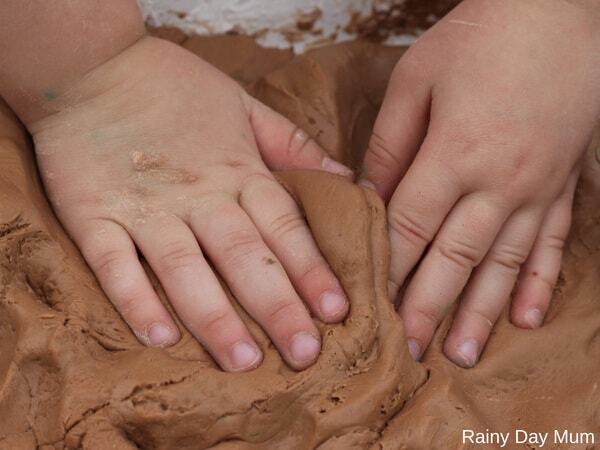 The mud dough will begin to crack and lighten in color just like real mud! This type of trace fossil is a mold fossil. 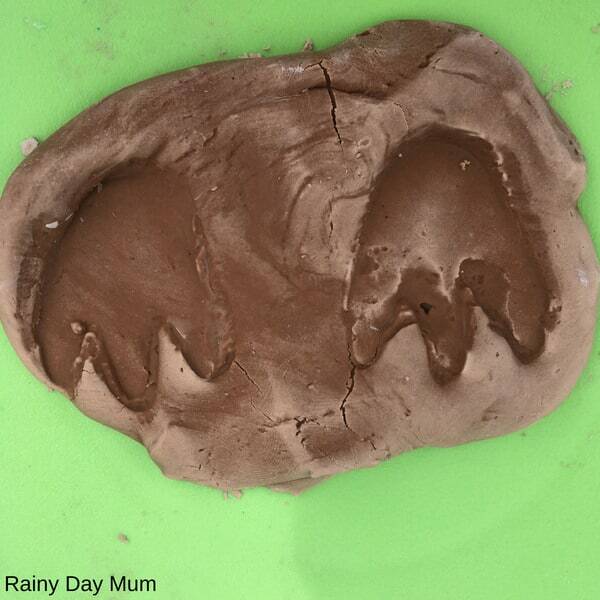 You could also make a cast of the footprint by filling in the track with plaster of Paris or something similar. (Note that plaster of Paris is not edible. Be sure to read the directions and cautions before use.) You won’t be able reuse the dough after you create the cast. After making dinosaur footprints in the mud, my kids made handprints in the mud. Once preserved, handprints would also be considered trace fossils. 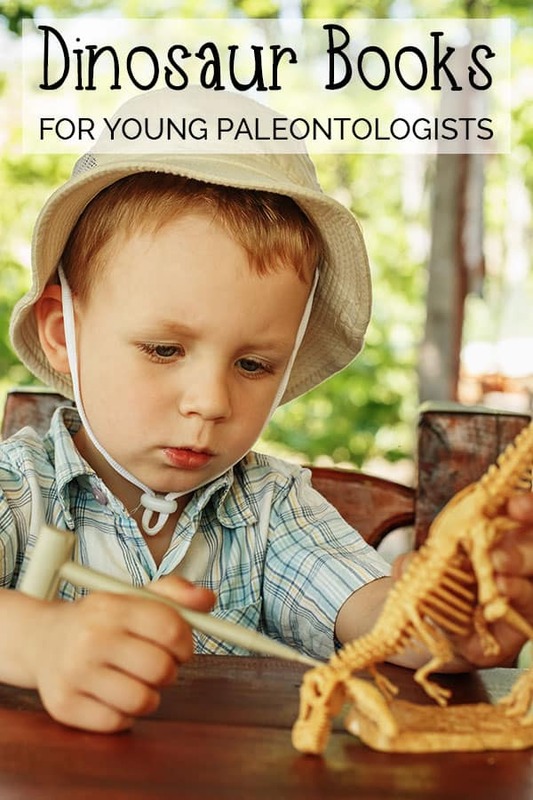 One of my favourite books to read when we explore fossils is Digging Up Dinosaurs by Aliki. It’s part fiction part non-fiction and goes through the work of a Paleontologist digging up fossils and how they do it. Fossils are usually found in sedimentary rocks. 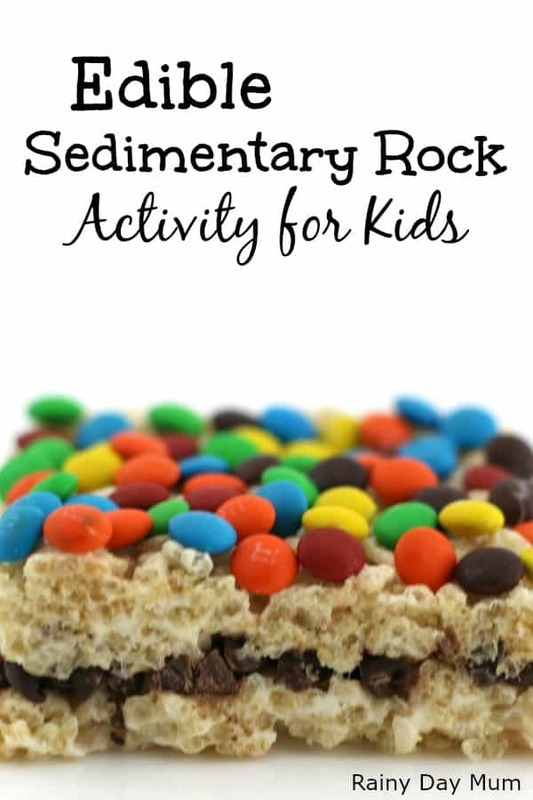 Use this edible sedimentary rock activity to learn about rock formations and layers. 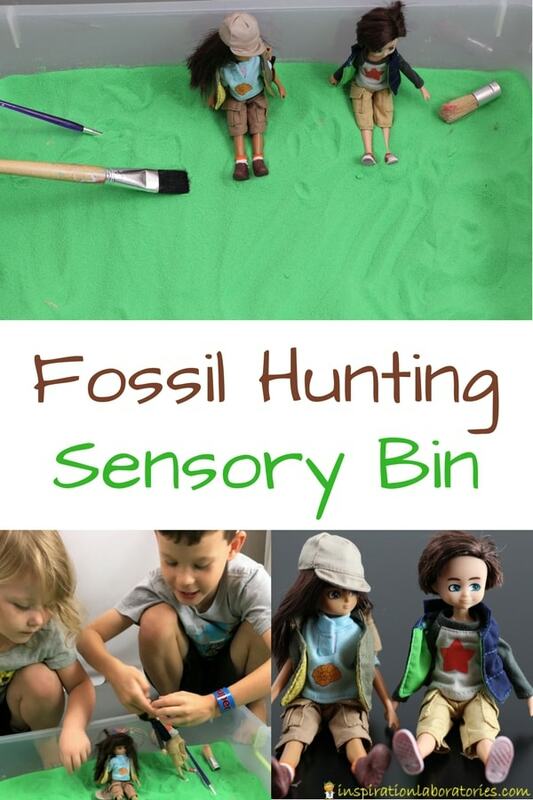 Pretend to be a palaeontologist with a fossil hunting sensory bin. 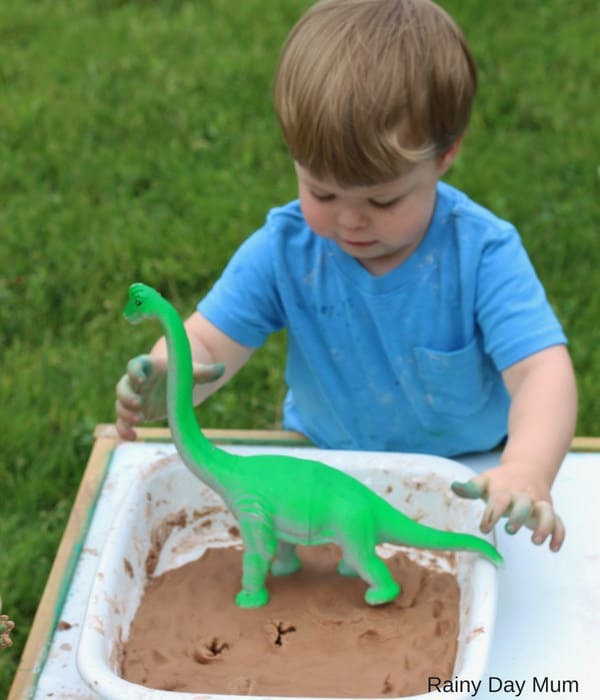 Check out this collection of dinosaur activities for kids. You’ll find ideas for literacy, math, science, pretend play, and more. 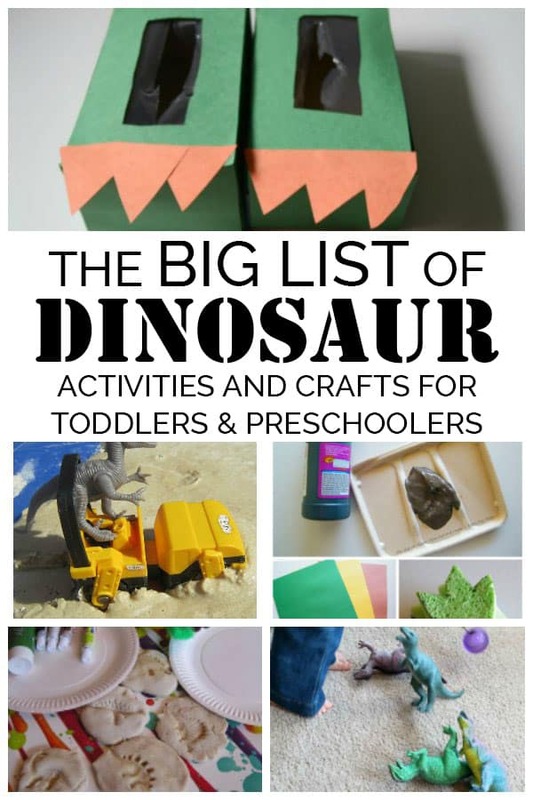 You’ll also love this dinosaur book list.